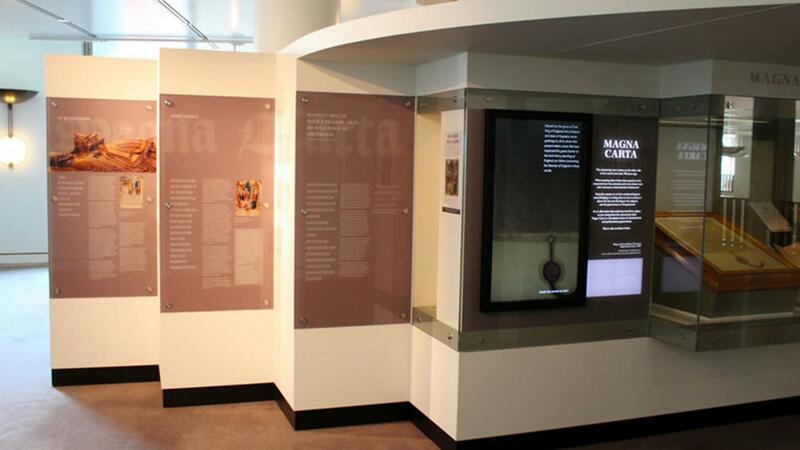 The above photo of the Magna Cart Exhibition is open to the public in Parliament House Canberra. On 15 June 1215 at Runnymede, King John agreed, under oath, to the Magna Carta, the Great Charter, and sometimes also called the Magna Carta libertatum, the Great Charter of Liberties. It was first sealed on 19 June 1215 and then distributed widely. This massive document was revised several times - reissued in 1216, revised in 1217 and 1225, and a 1297 version was brought into English law virtually unchanged from the 1225 version. One of only four of the authentic copies of the 1297 version remains in the custody of the Australian Parliament. This copy is on display to the public with an excellent series of information and education panels. The original charter embodies the principles underpinning the emergence of parliamentary democracy and the legal system in the UK, in the free world more generally, and especially in Australia: limiting arbitrary power, curbing the right to levy taxation without consent, holding the Executive to account, and affirming the rule of law. In our Australian democracy these are principles are too often taken for granted, and often not fully understood. They are the foundation stones of our major institutions, notably our Parliament and our Courts. Magna Carta and the freedoms it espouses are also fundamental to the values we have cherished for centuries. And they are values that should unite us all, especially as these days they are being challenged by those opposed to the rule of law. What is the meaning of Liberty? Why should a King operate within the Law?